Dear readers, I need your feedback to help me write my next blog. Some things turn out to be much more complicated than I imagine. In my last blog, I compared two air photos of a woodland and wetland reserve, from 1945 and 2006. I concluded, “From the photos above, I’d be confident that – by any measure of vegetation condition or ecosystem ‘health’ – the woodland is in better condition now than it was in 1945”. This triggered a number of emails and discussions. Two contrasting views were expressed. I don’t know that either is right or wrong, but both views are very different, and some people definitely preferred one over the other. I thought I’d write a blog to compares the two views, but before I do, I’d love to know what you think. Please take the time to fill out the quick poll below. You can’t say it’s getting better, because the weather might have been really different on the two dates. There was a severe drought in the 1940s, so the changes you see are probably just because the site was drought stricken in the 1940s but received more rain recently. To see if vegetation condition really did improve, you need to compare photos that were taken in similar weather conditions. For example, both photos would need to be taken in the middle of droughts (or wet periods) of similar magnitude. It doesn’t matter what the weather or anything else was like on the two dates, that’s irrelevant. 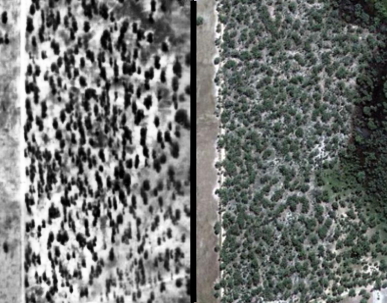 If – according to agreed criteria – the site is in better condition now that it was in the past, then you can clearly state that vegetation condition has improved, regardless of the weather. So what do you think? Which of these views do you agree with, or do you think both views (or neither) have merit? We spend a lot of money on ecosystem monitoring, so this question isn’t of historical interest, its equally relevant to the monitoring that we do now. Please spend a moment to answer the single question in the poll below. Imagine the following scenario. You live in a region where climatic conditions change regularly. In many years, little rain falls and droughts occur. These dry periods alternate with successive years of high rainfall. This variation may be caused by global El Nino – La Nina oscillations, for example. Your goal is to monitor changes over time in vegetation condition at a particular site, for the purpose of biodiversity conservation. To do so, you first decide which ecosystem attribute(s) to monitor. You might decide to select an attribute like native plant diversity, vegetation structure, soil biotic activity, or the abundance of hollow-bearing trees, etc. For now, don’t worry about what the attribute is, as the question below is relevant to most attributes. Assume that there is wide agreement that the attribute(s) you select is relevant and practical to assess. You then survey your remnant using your selected attribute. The remnant will be re-surveyed using the same technique in about 50 years time. After the second survey, the two data sets will be compared and, based on the results, a decision will be made whether vegetation condition in the reserve has improved or declined. If you would like to add a comment to explain your viewpoint, please do. The poll is anonymous, but your name will be shown if you leave a comment. If you have a friend or colleague nearby, please ask them to complete the poll too, as the more votes the better. They may have to log in separately, as the poll won’t allow repeated votes from the same user. This isn’t a trick question, and I don’t know that there is (or could be) a single right or wrong answer. I suspect that it (partly) depends on how we frame the question. In my next blog I’ll summarize the poll results, and will try to break down the arguments that underpin the two approaches. Previous Growback 2: A shrinking wetland? You are simply comparing one time to another at one place and concluding that an improvement has occurred. There is nothing at all wrong with that observation. I suspect some have assumed your observation is intended to imply some kind of climate change impact. I don’t think that is what you are attempting to do at all. In any case, that could not possibly be done with a sample size of one. Hmmm…these things have a habit of coming around and biting you in the bum, but, you have to make do with what you’ve got. The question was comparing two points in time 50 years apart and the photos are all you’ve got. You’re probably right too, most if not all measures of vegetation condition would say that 2006 is better than 1945, which, put simply, was your question. Yes, many things need to be considered and in a perfect world condition would be measured in similar climate, etc., and we need to understand site processes over time and space, but we operate in a world where you’re targets need to met in order to determine success to justify funding for projects over other (just as worthy) projects. As a land manager and consultant, i see that sometimes ecologists need to make those hard conclusions rather than being cautious (often seen as indecisiveness outside the industry) for the benefit of the project and site condition. The danger is believing that it WILL be in a better condition and letting monitoring and management slip. If to measure success and all you’ve got to go on is two photographs at two points in time, then congratulations on the management effort it looks like they have done well, just don’t become complacent…otherwise your backside might be at risk! Perhaps disturbance history could be consdidered. If were looking at change in a relatively intact system where changes in health may be more subtle, weather conditions at the time may give the impression of a postive trend when when a general decline is occuring or vice versa. In contrast, weather conditions may have little influence on any trend in ecosystem health in a heavily disturbed site. The utility of one approach or the other will depend on the criteria to be used and so will, in part, be influenced by the quality of the photos (itself influenced by various factors including film type, weather, etc) and portion of the photo (scale) being looked at. These two things interact, varying from photo to photo. To my eyes (mind?) trees in the 1945 photo may be taller. Which is better? Taller? Denser?